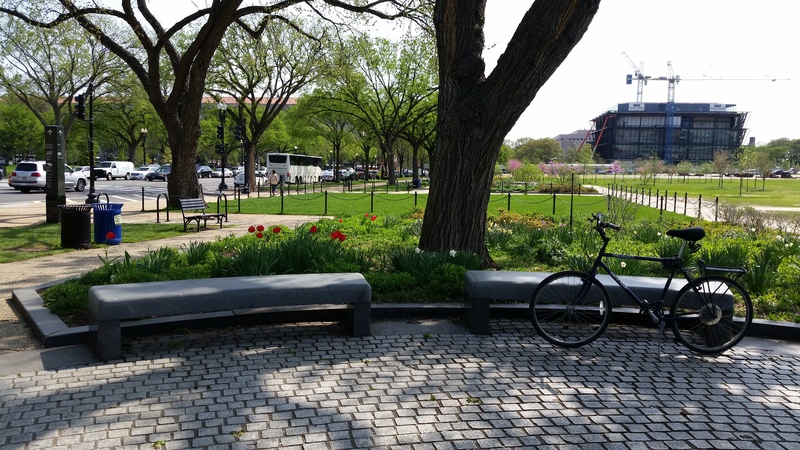 During today’s lunchtime bike ride I stopped to rest on a bench on 17th Street, near President’s Park, just south of The White House. As I sat there for a few moments watching the tourists go by, I noticed that the sidewalk seemed different than what I usually see. In fact, I didn’t recall seeing anything similar here in D.C. Sidewalks throughout the city are typically formed walkways made out of cement. But the sidewalks where I was sitting were made of stone. So when I had a chance later I looked into it, and my research confirmed that they are both unique and historic. The sidewalk is significant as the last remaining segment of an original streetscape feature used throughout President’s Park. While President’s Park South was filled and completed in the late 1870s, the side of the park along 17th Street was a low, badly drained area until new fill was added to bring it up to grade in the early 1880s. 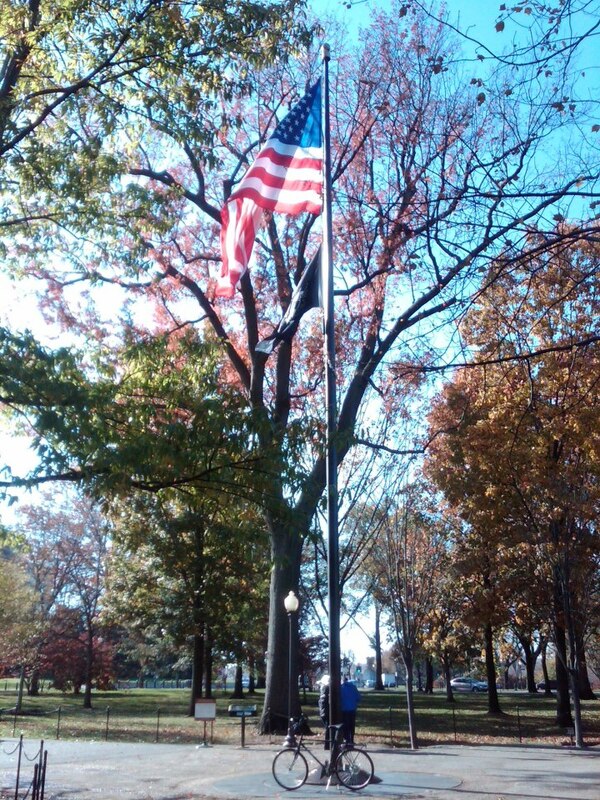 Then beginning in 1887, bluestone flag sidewalks were constructed along the front of the park bordering B Street, since renamed Constitution Avenue. While no date of construction can be firmly ascertained for the bluestone flag sidewalk on Seventeenth Street, it likely dates from this period or soon afterwards. A grassy strip between the sidewalk and the street was later added in the 1920s. Most of the bluestone sidewalk surrounding President’s Park was eventually replaced with ones constructed with cement forms. As the stones cracked or fell into disrepair, it was decided that it would be cheaper to simply replace them with the same type of sidewalk that is present throughout the rest of the city. This was done everywhere except, for some reason, along 17th Street. What stone sidewalk remains consists of rectangular bluestone slate flags, six-feet square, and extends along the east side of 17th Street from opposite C Street to opposite E Street (MAP). The sidewalk is separated from the granite curb by what was once a three-foot wide grassy strip, which is now filled in with granite pavers. The sidewalk is not a tourist attraction. In fact, I doubt anyone walking on it even noticed it was different, let alone had any idea of its history. But I enjoyed seeing it, and thinking back about the way things were at the time when the bluestone sidewalks were constructed. The Civil War had been over for not all that long, and Grover Cleveland was the President. The Washington Monument was almost completed and would open the following year. The Catholic University of America was founded, and the first Woodward & Lothrop department store was built. Alexander Graham Bell built his Volta Laboratory in Georgetown. There were no automobiles, so the streets were used by horses and carriages. And form and quality were considerations in public building projects, not just price and practicality. Sadly, despite having worked in downtown D.C. for the past 30 years, I had never visited the United States Botanic Garden during the Christmas holiday season before this year. I’ve been there many times but not during the holidays. But a friend who only lived here for a year before moving out of the area knew about the Botanic Garden’s annual holiday display, entitled Season’s Greenings, and the sights, smells, and sounds that accompany it. When she asked me about this year’s display, it prompted me to go check it out. And I’m so glad I did. This year’s display is a multifaceted one that stretches throughout the Botanic Garden. First, it includes the return of a series of D.C. landmarks made out of plant materials. The holiday display also includes thousands of blooms throughout the Conservatory, from exotic orchids to a showcase of heirloom and newly developed poinsettia varieties in the seasonal Poinsettia Room. Lastly, this year’s holiday decorations include a showcase of model trains chugging around, below, through, and above plant-based recreations of iconic sights and roadside attractions from across the United States. I will be covering the Poinsettia display, and the model train and roadside attractions showcase in the near future. Today’s blog post focuses on the collection of D.C. landmarks, all made from a myriad of plant and other natural materials, which is displayed in the Garden Court. There are a dozen local landmarks and memorials on display this year. The White House swing set, which had been included in previous years, was not present this year because the actual swing set is no longer at the White House. In it’s place is the Albert Einstein Memorial. Also new this year is the National Museum of African American History and Culture, which opened a little over a year ago. All of the landmarks would be incredible in and of themselves. But knowing that they are made of plants adds to the experience. For added holiday cheer at the Botanic Garden, there are concerts on Tuesday and Thursday evenings in December, when hours are extended until 8pm. If you can, I highly recommend going on one of these days for both the music and to see the exhibit and plant collections illuminated by colorful lights. One of my first thoughts after seeing Seasons Greenings was wishing that I had known about it and gone in previous years. So do yourself a favor and go so you don’t have the same thought years from now. NOTE: My blog post on “Seasons Greetings: Railroads and Roadside Attractions” will appear next Monday. 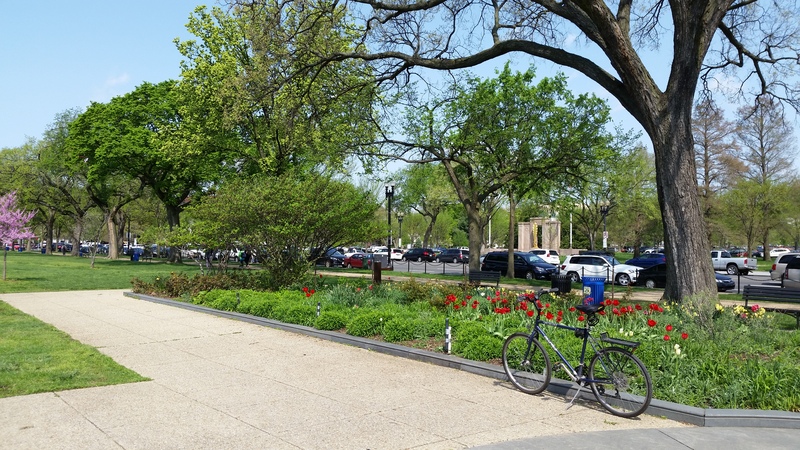 The German-American Friendship Garden, where I went on this lunchtime bike ride, is located on a direct line of sight between The White House and The Washington Monument on the National Mall, at 1600 Constitution Avenue (MAP) between 15th and 17th Streets in northwest D.C. 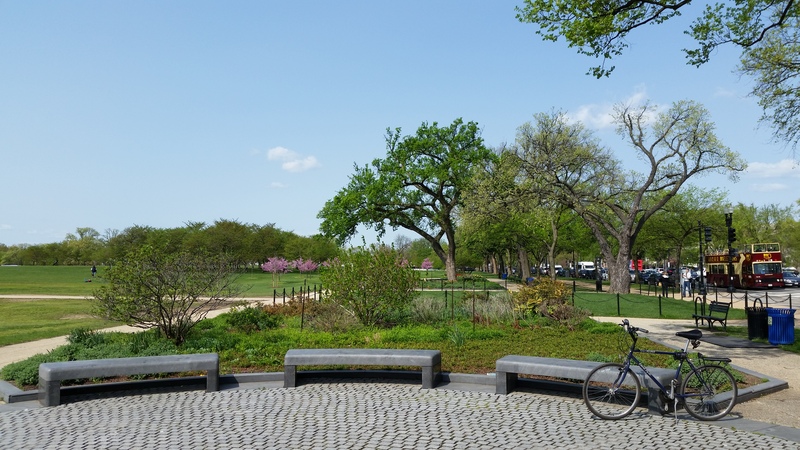 The ornamental garden’s design, developed by landscape architect Wolfgang Oehme, features plants indigenous to both Germany and the United States, and contains benches on which visitors can rest while enjoying the gardens. The garden was commissioned in 1982 after a visit to D.C. by German Chancellor Helmut Kohl. 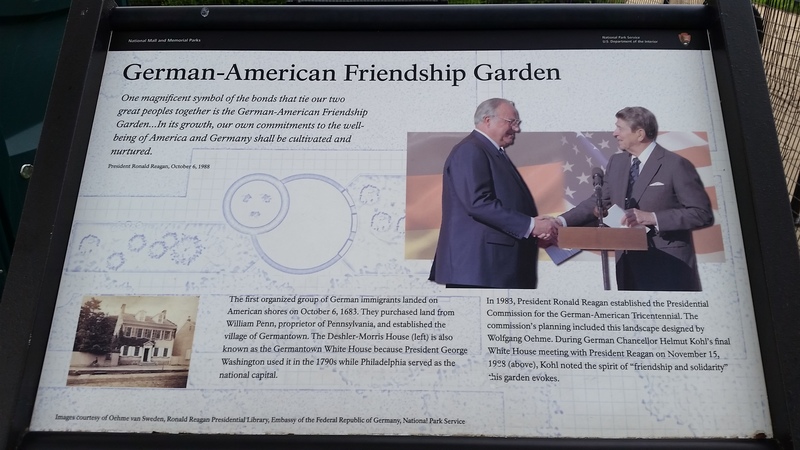 After the Chancellor’s visit, President Ronald Reagan created a Presidential commission to design and construct a garden to commemorate the tricentennial anniversary of the first German immigration to America, and celebrate 300 years of friendship between the United States and Germany. Later, the garden was dedicated at a ceremony in November of 1988, which was attended by both President Reagan and Chancellor Kohl during their last meeting together. 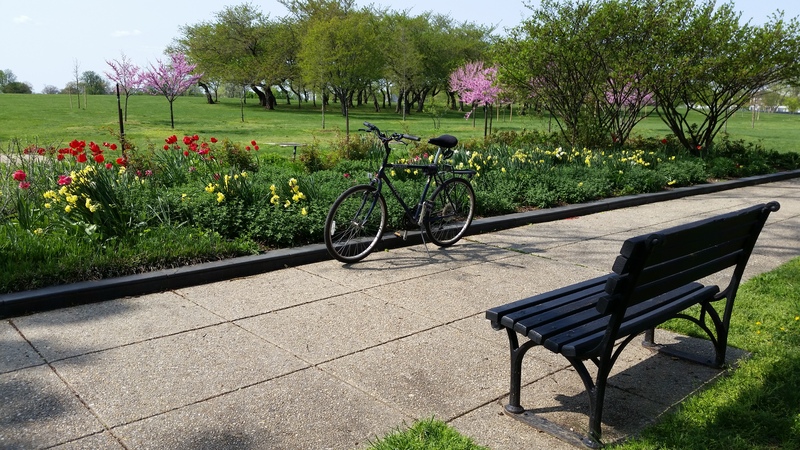 Eventually, the garden was in need of extensive restoration, so in 2013 an initiative was jointly launched by the German Embassy, the National Park Service, and the Association of German-American Societies of Greater Washington D.C. Subsequently, new flower beds and other native plants were planted and revitalized in the fall of that year. A new irrigation system was also installed, and the central square panel of the garden’s plaza was restored in keeping with Oehme’s original design. The garden has been the site of annual celebrations on German-American Day, a holiday in the United States which began in 1883. The custom, observed each year on October 6th, died out during World War I as a result of the anti-German sentiment that prevailed at the time, but was revived during Reagan’s presidency in 1983 on the 100th anniversary of the first celebration. 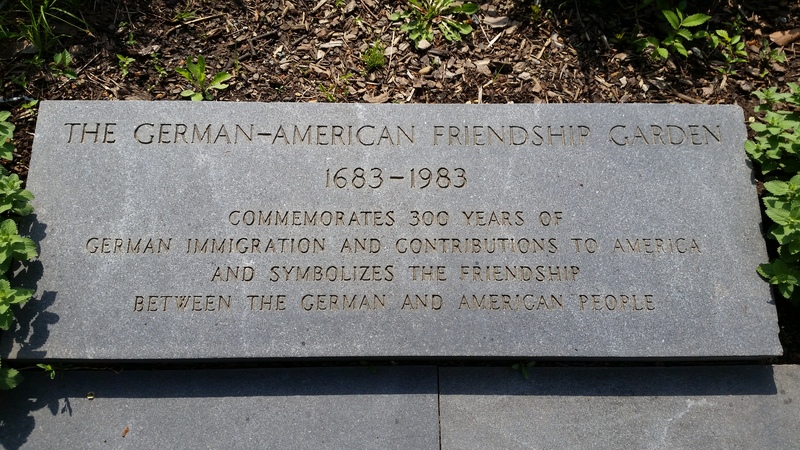 Today, the German-American Friendship Garden’s ideal location in one of the city’s most well-travelled tourist areas provides it with an estimated seven million visitors passing by each year. Unfortunately, most overlook the garden as they walk by it on their way to another destination. So my recommendation is to make the garden a specific destination so you don’t also miss out on all that it has to offer. When tourists on the grounds of The Washington Monument gaze up at the tribute to our nation’s first President, they seldom are aware of the other, smaller but similarly-shaped stone monument that is also located there on the same grounds, in the shadows of the 555-foot obelisk that towers over the National Mall. Or if they do happen to notice it, they have no idea what it is. It is called the Jefferson Pier, and it is only 391 feet on a northwest diagonal from the center of the Washington Monument. However, it pre-dates the Washington Monument. In fact, the original stone monument served as a marker, aiding surveyors and serving as a benchmark during construction of the monument. On December 18th, 1804, a simple granite obelisk was erected at the intersection of lines from the front doors of The White House, known at that time as the Executive Mansion, and the U.S. Capitol Building. That intersection is etched on the top of the stone marker. The stone was located along 16th Street, almost due south of the center of the White House, due west of the center of the Capitol building, and due north of the center of the Jefferson Memorial (MAP). It was intended as part of a meridian system used to align city streets and in the development of the young nation’s new capital. It was also the destination for this lunchtime bike ride. President Thomas Jefferson wished for the new national capital to be a new “first meridian,” the longitude (0′ 0″) from which distance and time would be measured. But the 16th Street meridian never became the official prime meridian. Instead, a meridian on 24th Street did. Then in 1884, the world recognized the longitude of Greenwich, England as the prime meridian, and it remains so today. To understand how the meridian stone came to be known as “The Jefferson Pier” it is necessary to first understand that the geography of the city was originally much different than it is now. Tiber Creek flowed through that area of the city, and the entire Mall area west of where the Washington Monument is now located was under water. Tiber Creek, along with several other small streams, were eventually transformed into the Washington City Canal, a system that connected the Washington Waterfront, the Capitol Building, the White House and other areas downtown with The Chesapeake and Ohio Canal and Towpath‘s first lock in Georgetown during the mid to late 1800’s. Boats and barges navigating the Washington City Canal via the C&O Canal and the Potomac River routinely used the meridian stone marker as an anchoring post. Although it was never officially designated so, the name used by boat captains and others stuck, and the prime meridian marker they used as an anchoring post for their boats came to be referred to as the Jefferson Pier. The original stone marker was destroyed by the U.S. Army Corps of Engineers in 1874. But the spot was recovered and a replacement marker was erected December 21, 1889. This is the stone that remains today. The stone reads, “Position of Jefferson Pier Erected Dec. 18, 1804. Recovered and Re-Erected Dec. 2, 1889. District Of Columbia.” A line has also been etched out on the face of the stone to indicate where the shoreline of the Potomac River once reached the Pier Stone. Graffiti is defined as “writings or drawings that have been scribbled, scratched, or sprayed illicitly on a wall or other surface, often in a public place.” It goes back to ancient times and has been found in the ruins of Pompeii, in the Catacombs of Rome, and on walls in ancient Egypt. In is usually considered to be defacement and vandalism, and is often a crime. However, some graffiti rises above the rest in its aesthetic quality, the message it conveys or other unique characteristics, leading it to gain public acceptance. The graffito commonly known as “Kilroy Was Here” is an example of this. In fact, it gained such acceptance and popularity that it is the only example of graffiti which has been officially memorialized in one of D.C.’s national monuments or memorials. And it was this memorialized graffiti that was the destination for this lunchtime bike ride. 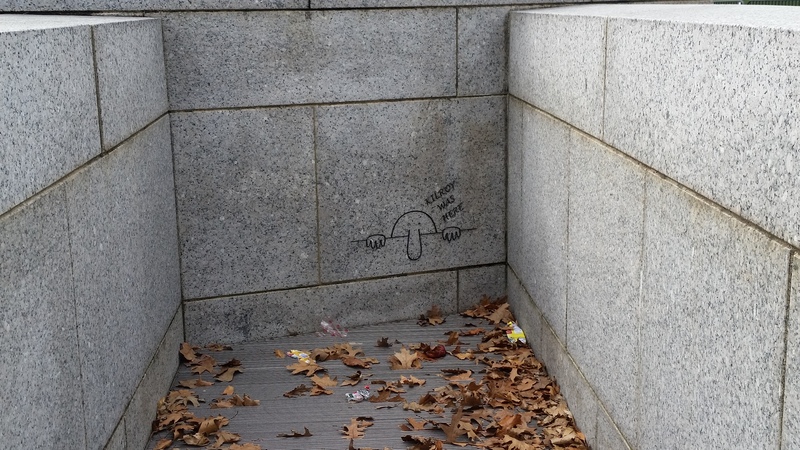 There are two examples of “Kilroy Was Here” on the outside of The National World War II Memorial, which is located on the National Mall between The Lincoln Memorial and The Washington Monument in Downtown D.C. However, most people do not know of the graffiti’s existence or location, which makes it all the more interesting to me. So while I was visiting the memorial, I watched as hundreds of visitors mulled around the arches and state pillars which are arranged around the granite memorial’s grand plaza and fountain, but not one person made their way to the back of the memorial behind the wall of stars. It is there, near the backs of the Pennsylvania and Delaware pillars, behind gold-toned gates, in grated areas designed for service and maintenance access, that the Kilroys reside. The origin of Kilroy is open to discussion or argument, and much has been written about the beginning and proliferation of the now-famous cartoon depiction of a man with a bald head peering over a fence that hides everything except his eyes, his long U-shaped nose, and often his fingers gripping the top of the fence, accompanied by the proclamation, “Kilroy Was Here.” But perhaps the most credible story is the one which was detailed in a 1946 article in the New York Times. As reported by The Times, an American shipyard inspector named James J. Kilroy was most likely the man behind the signature. As he inspected the riveting in newly constructed ships, he chalked the words on bulkheads to show that he had been there and performed his inspection. To the troops in those ships, however, it was a complete mystery. They didn’t know who Kilroy was or why he had marked their ships. All they knew about him was that he had “been there first.” So as a joke, they began placing the graffiti wherever they and other U.S. forces went, then claiming it was already there when they arrived. Kilroy became America’s super service member who always got there first. The tradition continued in every U.S. military theater of operations throughout World War II, and it became a challenge to place the logo in the most unlikely places. The marking gained momentum throughout the war, and spread to the civilian population. Following the war, both service members and civilians continued to scrawl versions of the graffito throughout the world. But the mania had peaked during the war. It lingered for a while, but the joke eventually died out as memories of the war faded. Although Kilroy Was Here is quite possibly the most prolific and well-known graffito in history, it surpassed being relegated to the category of mere graffiti. Over the years he has become part of popular culture. 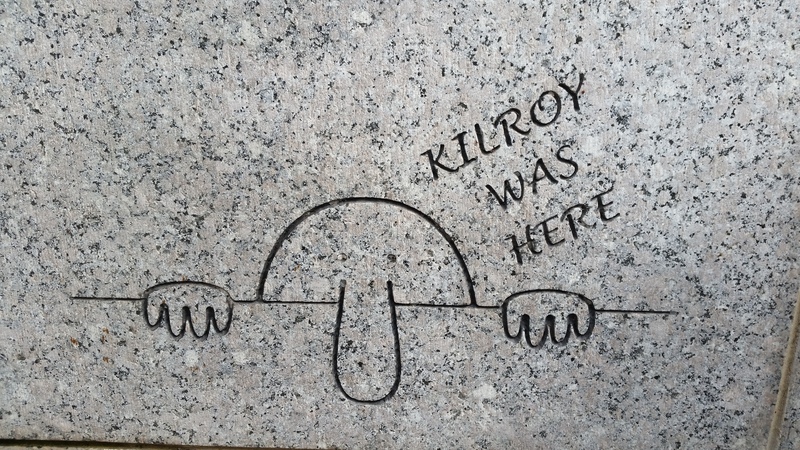 Examples of Kilroy may be found in movies such as “Kelly’s Heroes” and “On Our Merry Way,” and in television shows like “M*A*S*H,” “Home Improvement” and “Seinfeld.” Kilroy has even been the subject of poems, novels, and songs. And there have reportedly been sightings of him on the Statue of Liberty, the Arch de Triomphe in Paris, the Marco Polo Bridge in China, huts in Polynesia, at the top of Mt. Everest, and scrawled in the dust on the moon. Kilroy can be seen in thousands and thousands of places. However, he is apparently difficult to find at the National World War II Memorial. But now that you know how to track him down, I recommend that you make the effort to find him the next time you visit the memorial. 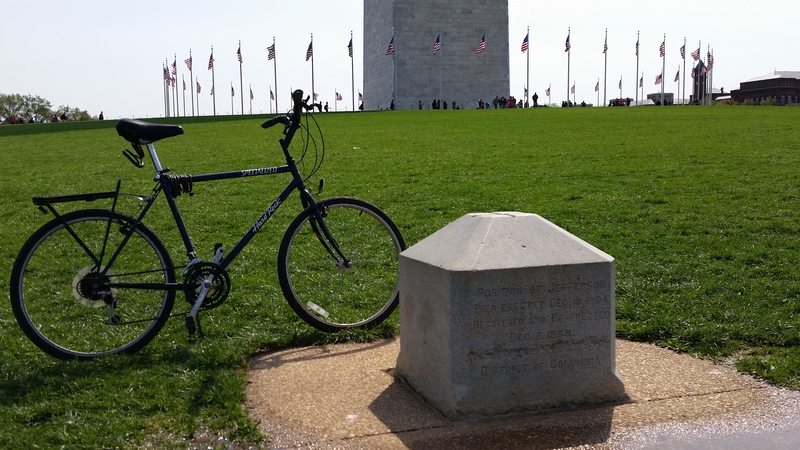 I most often tend to ride to and then write about the D.C. area’s lesser-known, off-the-beaten-path monuments, memorials and other attractions. But for this lunch time bike ride I chose to do the opposite. 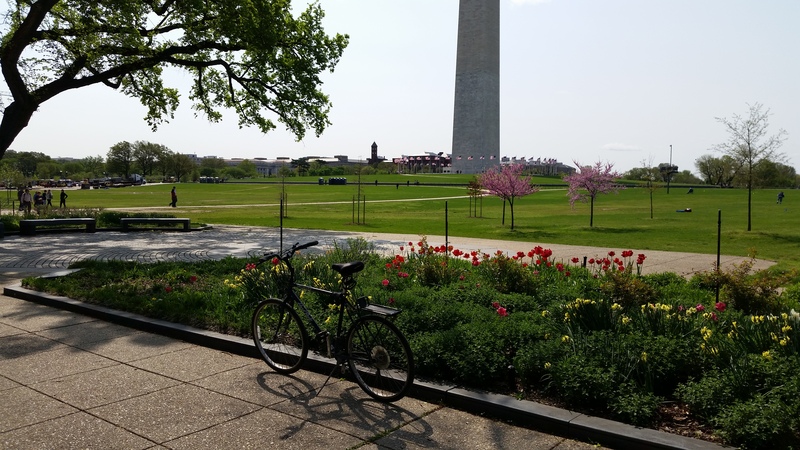 I visited one of the most well known and widely recognized monuments in not only D.C., but the entire world – the 555-foot and 5-inch obelisk known as The Washington Monument. But what I find most interesting about the monument are details about it that are not well-known. Not only did the simplistic appearance of the monument turn out significantly different than what was originally envisioned, it is not located in the place where it was originally intended. And it isn’t even the first Washington Monument in D.C.
Just days after Washington’s death in 1799, a Congressional committee proposed that a pyramid-shaped mausoleum be erected within the Capitol which would also serve as a monument to the nation’s first president. However, a lack of funds, disagreement over what type of memorial would best honor him, and the Washington family’s reluctance to move his body from his Mount Vernon home prevented progress on the proposed project. Years later, on the 100th anniversary of President Washington’s 1732 birthday, the Washington National Monument Society was formed by former President James Madison and then current Chief Justice of the Supreme Court John Marshall, and began accepting donations to build a monument. Four years later, a renewed interest in construction a monument resulted in a design competition being held by the Society. The winning design came from architect Robert Mills, who also designed a number of Federal buildings in D.C., including the Department of Treasury building, the U.S. Patent Office Building, and the old General Post Office. Mills’ design featured a flat topped obelisk topped, with a statue depicting a Roman-like Washington in a chariot in front of it, along with a rotunda and colonnade, all surrounded by 30 statues depicting the country’s Founding Fathers and Revolutionary War heroes. Excavation and initial construction of the monument began on July 4, 1848. However, a lack of funding resulted in the need to redesign the monument. In 1876 the current obelisk design was proposed. It was also during that year that President Ulysses S. Grant signed a bill for the Federal government to fund completion of the monument, which had been stalled by the Civil War. The monument’s construction took place during two phases, from 1848 to 1856, and from 1876 to 1884. A horizontal line of different colored marble from Massachusetts which was used when marble from the original quarry in Maryland was not available is visible approximately 150 feet up the monument, and indicates where construction resumed in 1876. There is actually a third, less-noticible shade of marble that was used when the builders, dissatisfied with the Massachusetts marble, switched to another quarry in Maryland for the final marble used in the monument. Thus, there are actually three shades to the exterior of the monument. In addition to a change in design, a change in location also occurred. Originally, Pierre Charles L’Enfant, the city’s architect, had planned for the memorial to be placed due south of the President’s Mansion (now known as The White House), and directly West of the Capital Building. However, the soil at that spot proved too unstable to provide the necessary support for the massive obelisk that had been proposed. So the planned site was moved. The present day monument is 119 meters southwest of the planned site, which is marked by a stone and plaque called the Jefferson Pier. 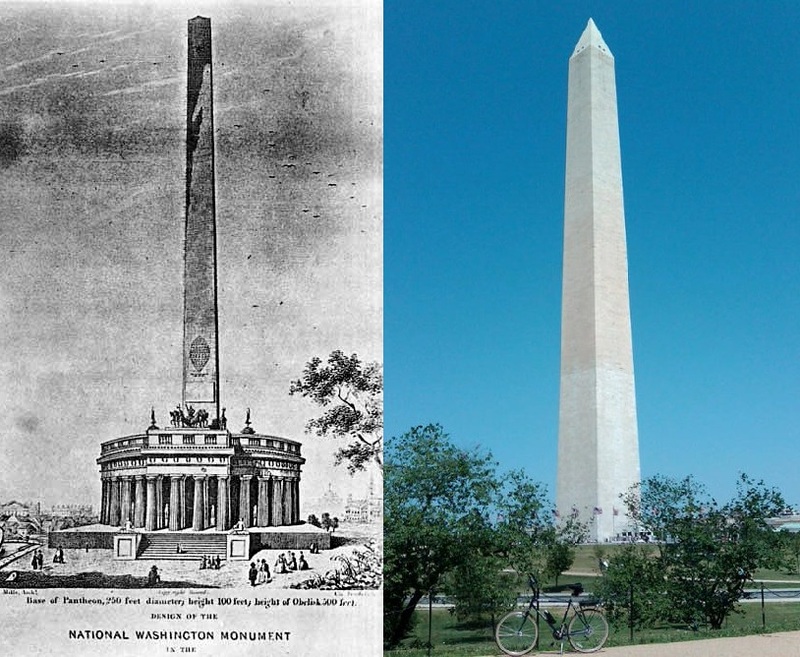 Delays in construction of the Washington Monument were due to the halting of construction between 1854 and 1877 due to a lack of funds, infighting within the Washington National Monument Society, and the intervention of the American Civil War. It was finally completed in 1888 after more than 40 years of construction, which had begun in 1848. During the interim, however, a comparatively modest monument in the form of an equestrian statue depicting Washington riding his horse during the Battle of Princeton was constructed. Now known as The Lieutenant General George Washington Statue, it was completed in 1860, more than a quarter of a century before the completion of the more well-known monument. 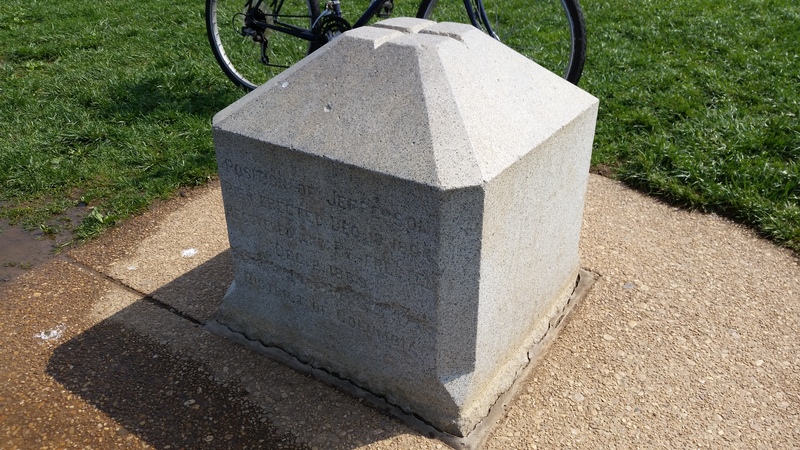 Located at 2 15th Street (MAP) near Madison Drive in downtown D.C., there are many other details and things you may not know about the monument that has become a centerpiece of the National Mall. For example, it held the title as the tallest structure in the world at the time it was completed. It lost that title in 1889 with the completion of the Eiffel Tower. However, the Washington Monument remains the world’s tallest stone structure as well as the world’s tallest obelisk. 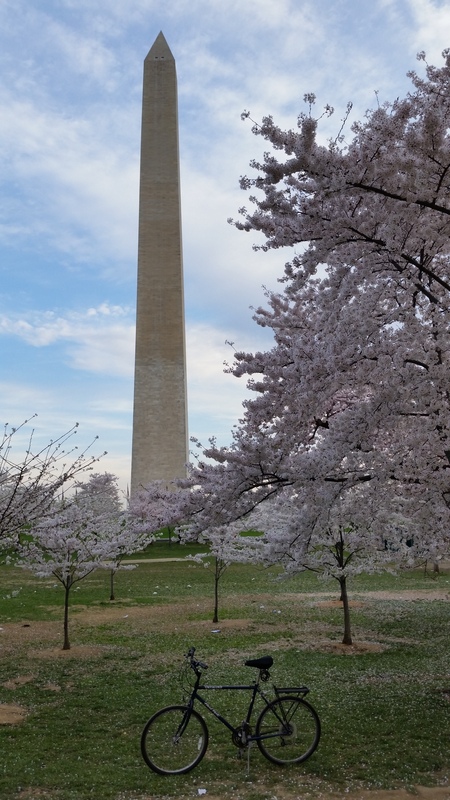 The monument stands as the tallest structure in D.C., and will continue to do so for the foreseeable future because, by law, no other building in the national capitol city is allowed to be taller than Washington Monument. Some other interesting facts about the Washington Monument include the following. The Masonic gavel previously used by George Washington in the laying of the cornerstone of the U.S. Capitol Building in 1793 was also used in the Washington Monument’s 1848 cornerstone ceremony, that had an eclectic guest list which included three future presidents, James Buchanan, Abraham Lincoln and Andrew Johnson, as well as Dolley Madison and Alexander Hamilton’s widow, Betsey Hamilton and, of course, the then-current President, James K. Polk. Also, there are numerous items and copies of important documents contained in a zinc case in the recess of the monument’s time capsule-like cornerstone, including: the Holy Bible; copies of the Constitution of the United States Declaration of Independence; a portrait of Washington; a map of the city as it was at that time; the 1840 United States Census; all national coins then in circulation including the $10 gold eagle; an American flag; the Washington family coat of arms, and; newspapers from 14 states. Additionally, the obelisk rests on an artificially constructed knoll that was designed to hide the original foundation. The monument is hollow on the inside, but its inner walls are set with 189 carved memorial stones, which were donated by individuals, cities, states, Native American tribes, companies, foreign countries, and even the pope. There are 897 steps in the staircase that leads to the top of the monument. The walls at the monument’s base are 15 feet thick. The Monument’s 36,491 white marble ashlar blocks, weighing a total of 90,854 tons, are held together by just gravity and friction, and no mortar was used in the process. And lastly, there are lightning rods at the top to protect the structure from lightning strikes, as well as eight synchronized blinking red lights, two on each face, which serve as warning lights to keep aircraft from striking the structure. So now that you know a little more about the monument that is not quite as simple as it initially appears, I recommend you go see the Washington Monument for yourself. Whether it is your first time or you have seen the monument before, you may find that you have a new appreciation for it. 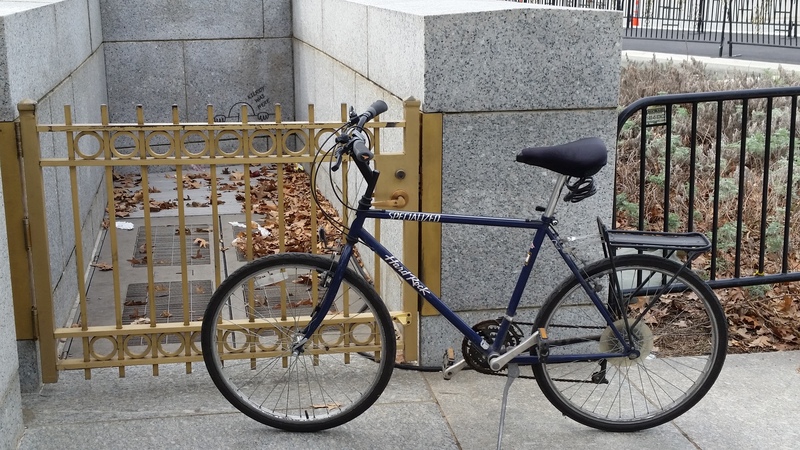 I’m going to be taking some time off from work for the holidays, so this was my last D.C. bike ride for the year for this blog. I’m actually taking the next few weeks off because, as a Federal employee, if I do not use a specified amount of my accrued vacation time before the end of the year the government will take it away. But for this ride, I commuted to the office anyway. 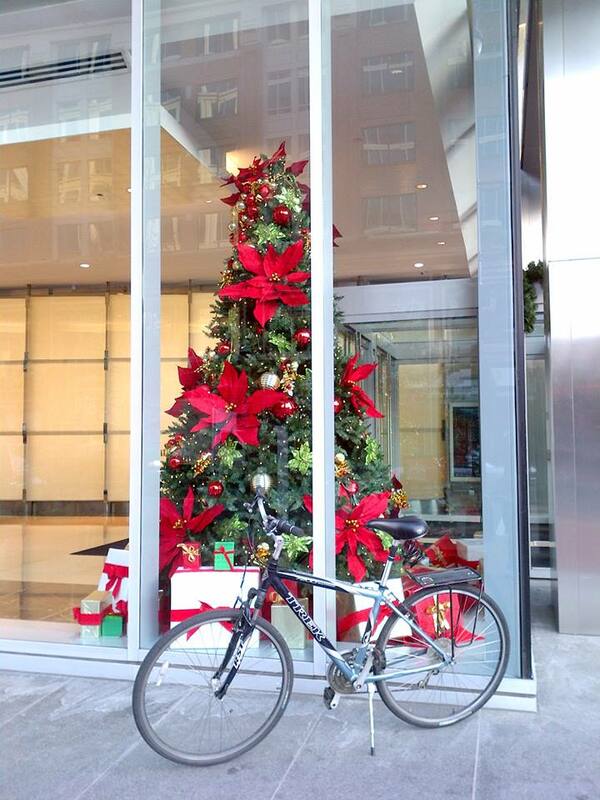 I then got on one of my bikes that I keep in the parking garage of the office building where I work, and spent the entire day just riding around the D.C. area to see and enjoy the Christmas decorations and holiday spirit, which can be found almost everywhere. It was a great ride to end the year. As I’ve stated previously in this blog, I am not a photographer. I’m just a guy that goes for bike rides on my lunch break at work, and takes a few snapshots of the places I go to and the things I see along the way. On this ride I took more photos than usual. 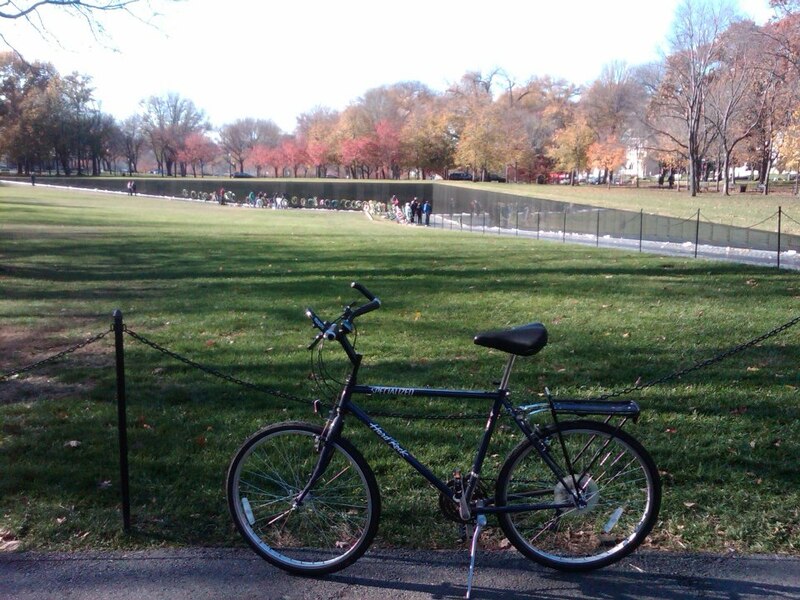 My favorite photo (above) from this leisurely bike ride is the one of a Christmas tree and holiday wreath left at The Vietnam Veterans Memorial Wall, with the image of both my bike and The Washington Monument reflecting off the polished granite panels containing the names of the servicemen and women who were killed or classified as missing in action during the Vietnam War. The photo seems to portray at the same time both the joy of the season as well as the solemnity of the memorial. Some of the other photos (below) which I’ve included with this blog post show several of the places which I have already visited this year and then wrote about in this blog, as well as some other places I intend to visit again and learn more about in the coming year. You can click on the thumbnails for full-size photos. 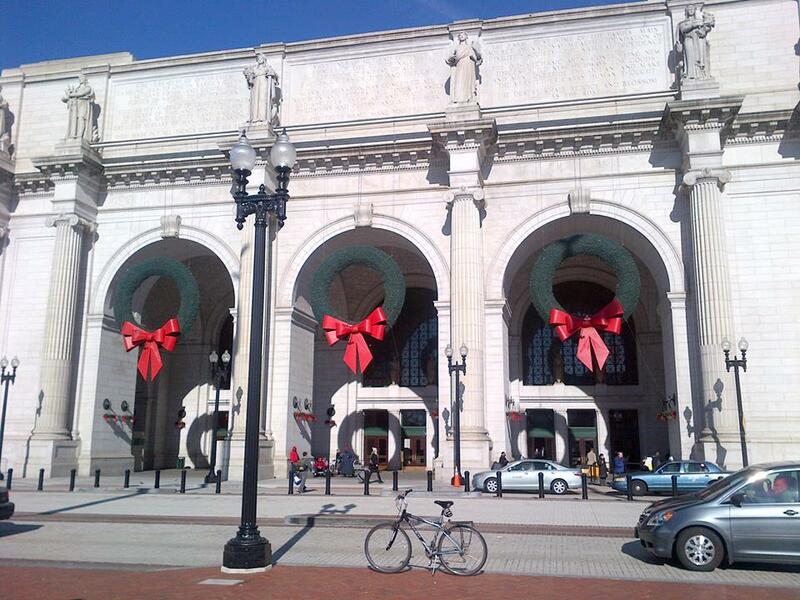 In order, these photos show: (1) Giant wreathes hanging at the front of Union Station in D.C., one of the busiest train stations in the country. 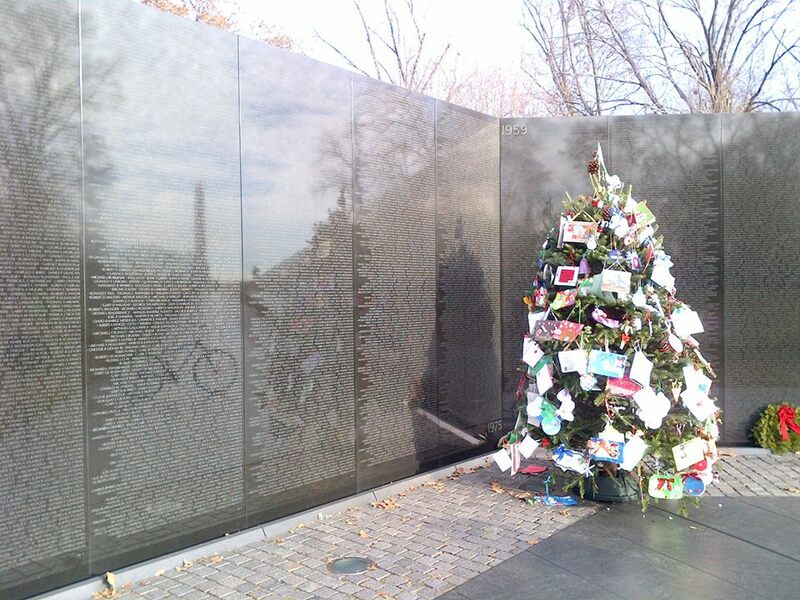 You can get a sense of the size of the wreathes by comparing them to the size of the people standing beneath them. 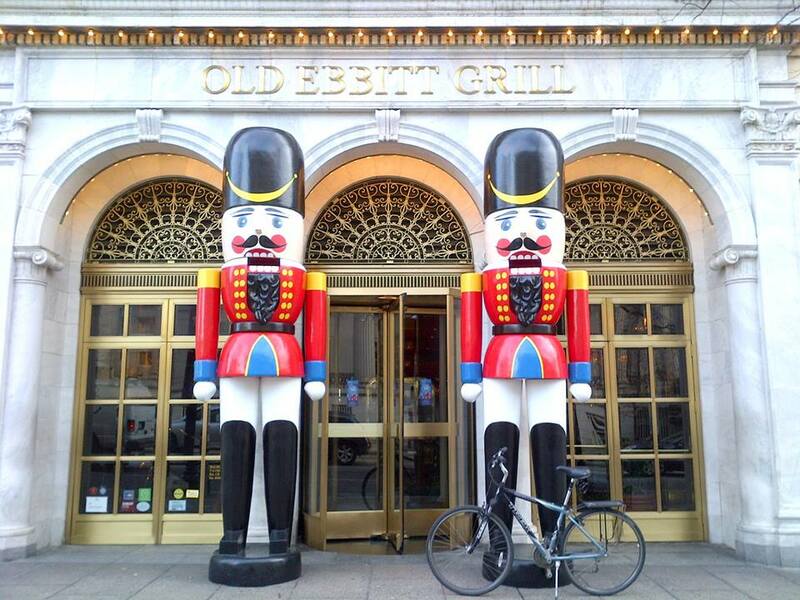 (2) Toy soldiers standing guard at the entrance to the Old Ebbit Grill on 15th Street, D.C.’s oldest bar and restaurant. 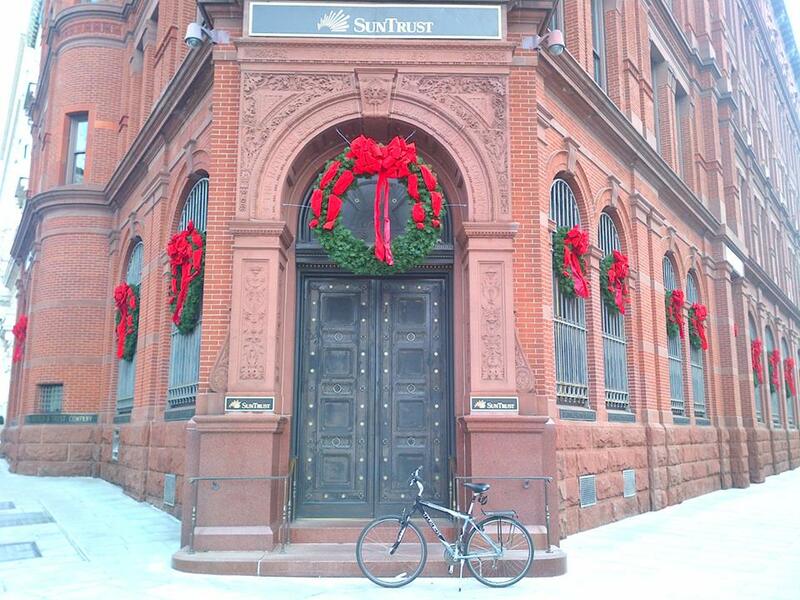 (3) Holiday wreathes on the old Sun Trust Building on 15th Street, across the street from the U.S. Treasury Department Building. 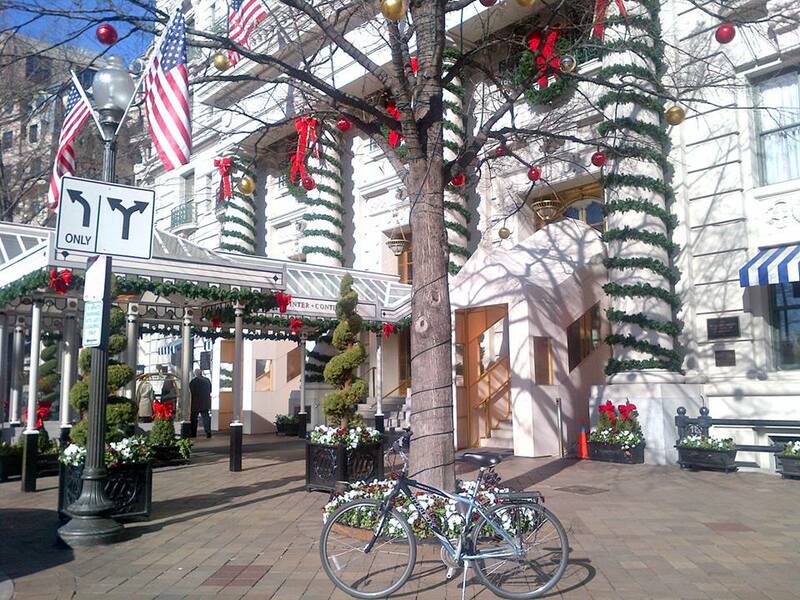 (4) Holiday garlands, wreathes and bows adorning the entrance to The Historic Willard Hotel. (5) The D.C. Fire Department’s Truck No. 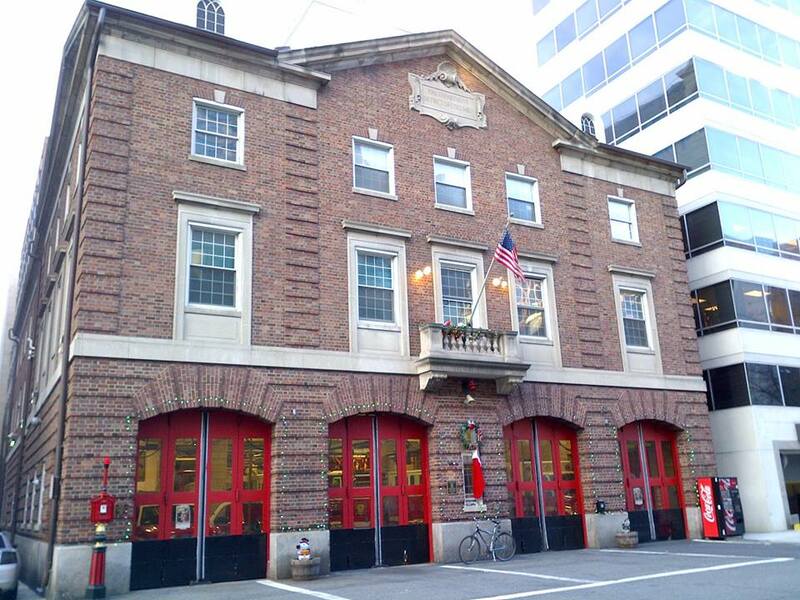 3 Fire Station on 13th Street in northwest D.C., which is decorated and lit up with Christmas lights. 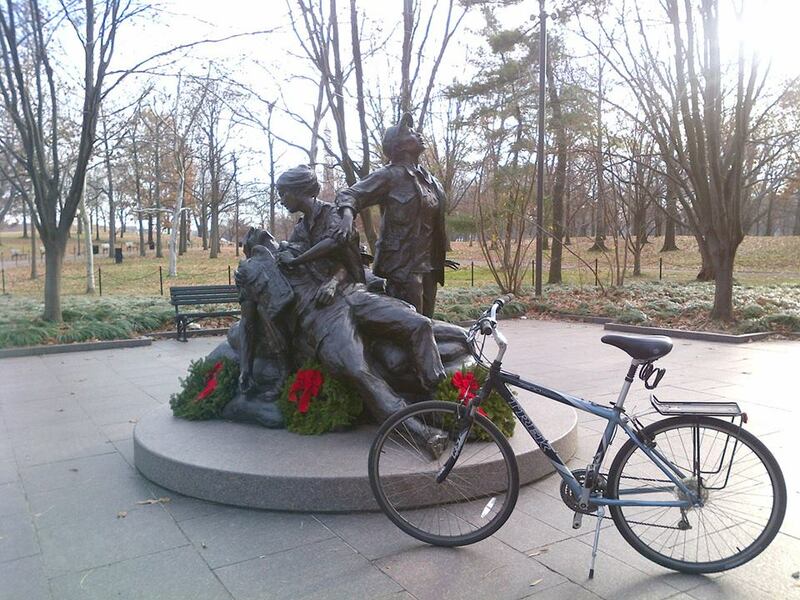 (6) The Vietnam Women’s Memorial is one of the memorials where wreathes are laid by Wreathes Across America, the group that supplies the Christmas wreathes at Arlington National Cemetery. 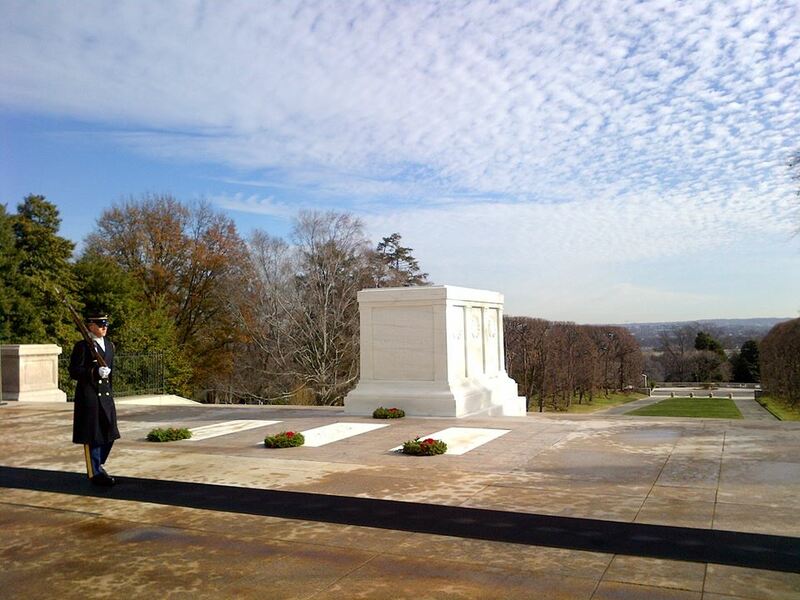 (7) The Tomb of the Unknowns at Arlington National Cemetery, with a tomb guard in the foreground “walking the mat.” The wreathes in front of the sarcophagus and graves are also part of the tribute at the cemetery by Wreathes Across America. 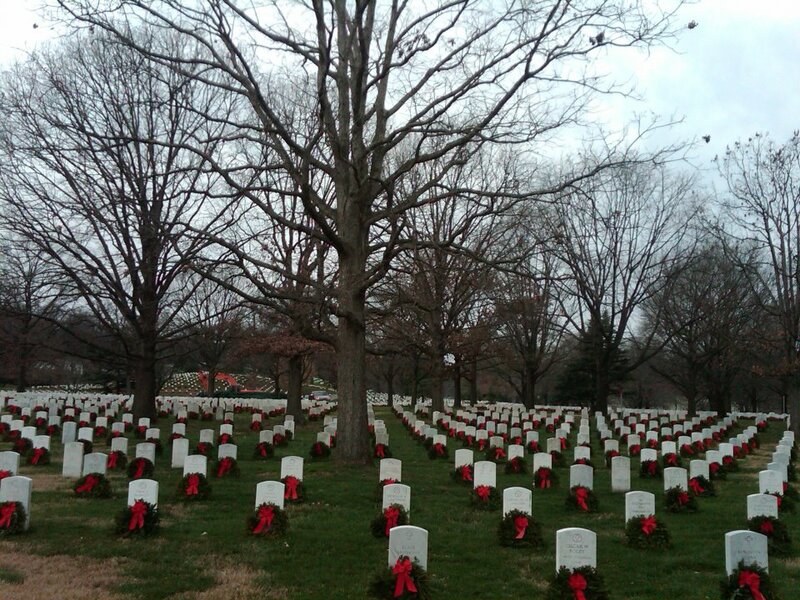 (8) Some of the more than 230,000 wreathes at Arlington National Cemetery which adorn the rows of white marble headstones. 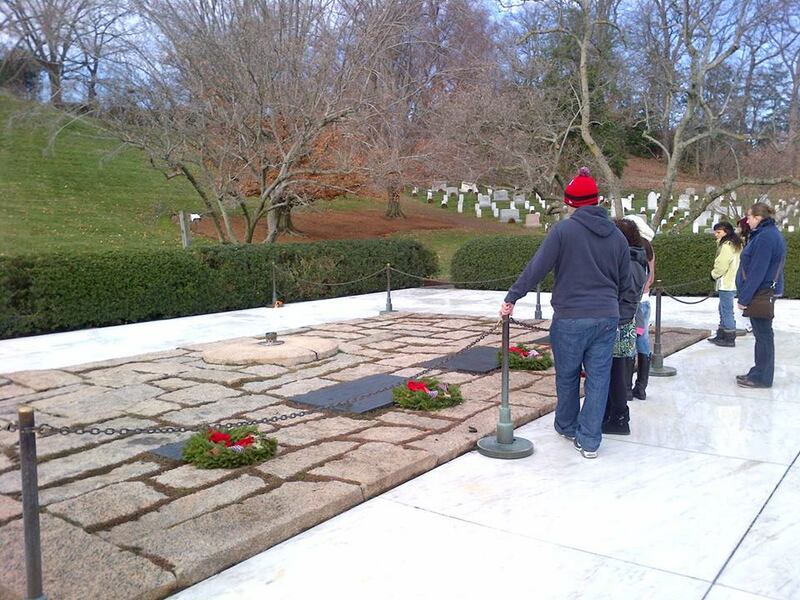 (9) Wreathes were also placed by Wreathes Across America at gravesites at The John F. Kennedy Eternal Flame. 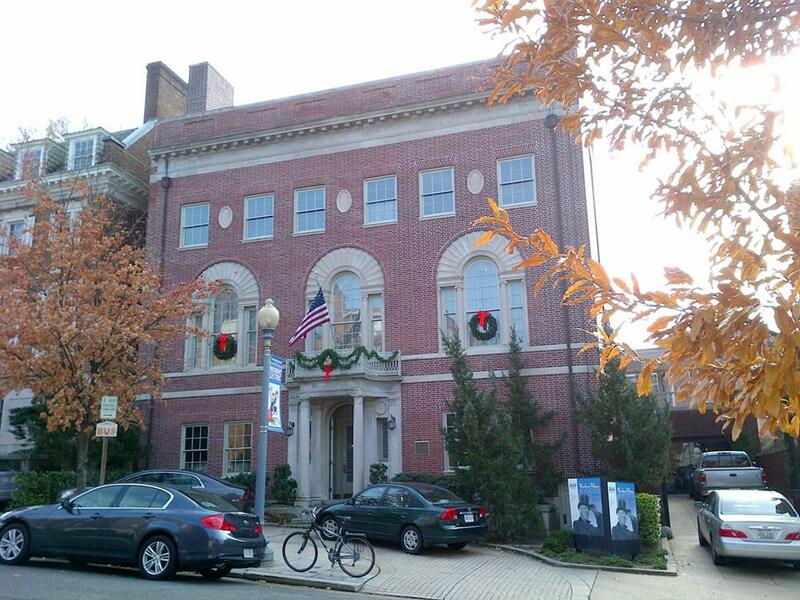 (10) The Woodrow Wilson House, the home of the only President to remain in D.C. after leaving office, is also decorated for the holidays. 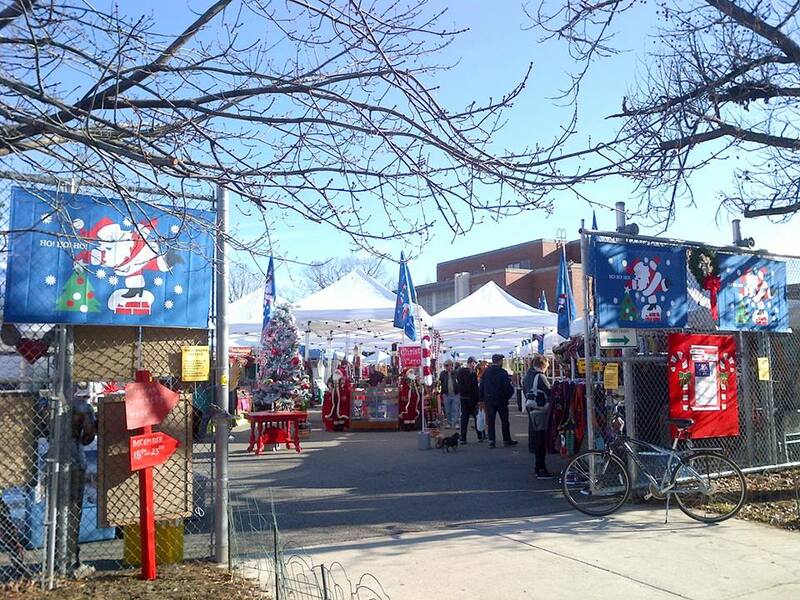 (11) One of the several outdoor holiday markets that spring up throughout the city in the time leading up to Christmas. 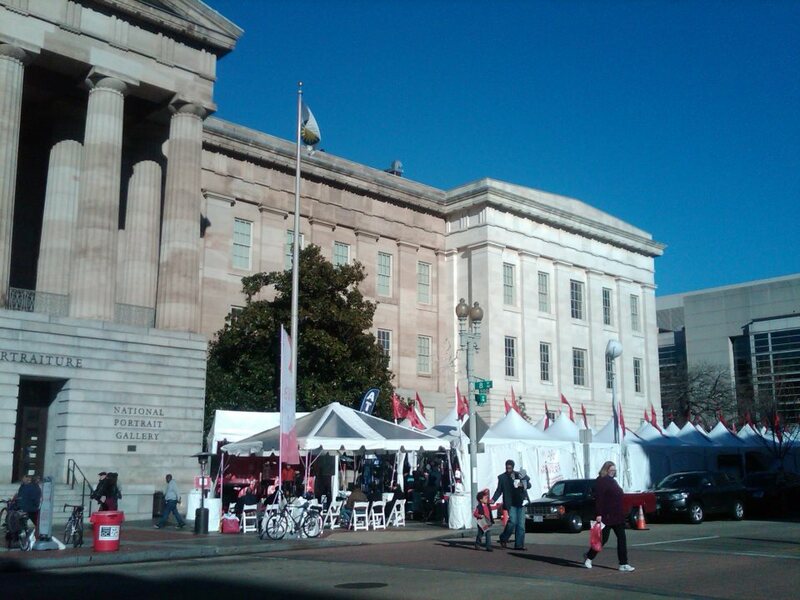 This one is The Downtown Holiday Market, which is currently in its 11th year. 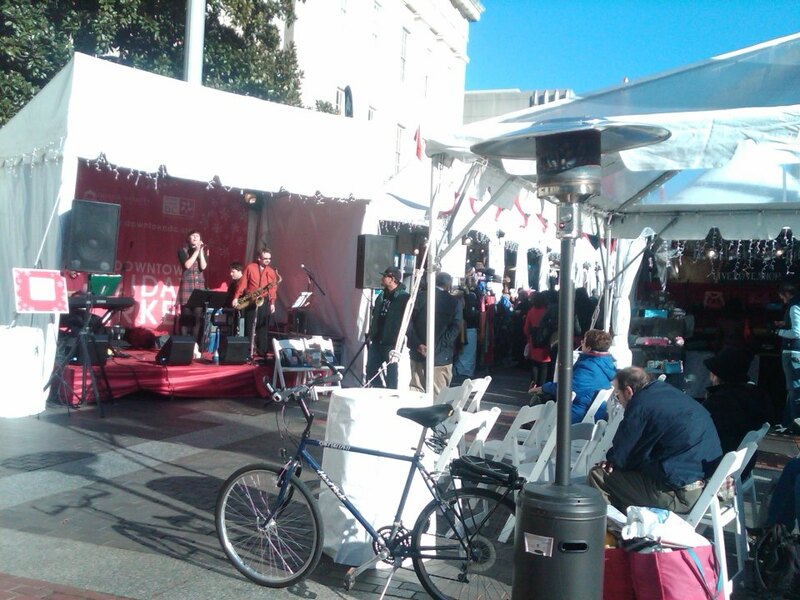 (12) If you’re fortunate, you can also happen upon live musiccal performances. This one was taking place on the sidewalk in front of the Smithsonian American Art Museum and the National Portrait Gallery between 7th and 9th Streets in the city’s Chinatown neighborhood. 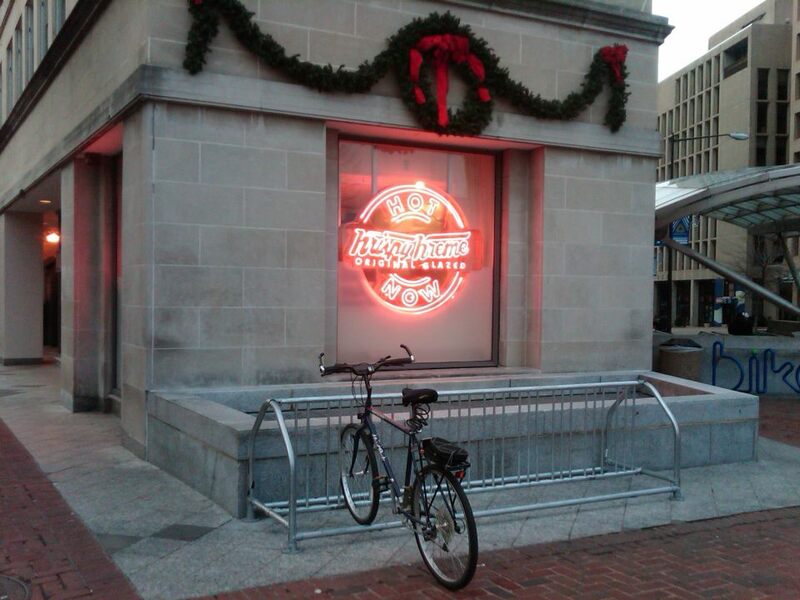 (13) The Krispy Kreme doughnut shop across from The Fountain at DuPont Circle is an excellent place to stop for an early morning snack when riding around the city to see the holiday decorations, especially when the “Hot Now” neon light is lit up. And even they decorated for the season. (14) An outdoor craft show and flea market on Capitol Hill. 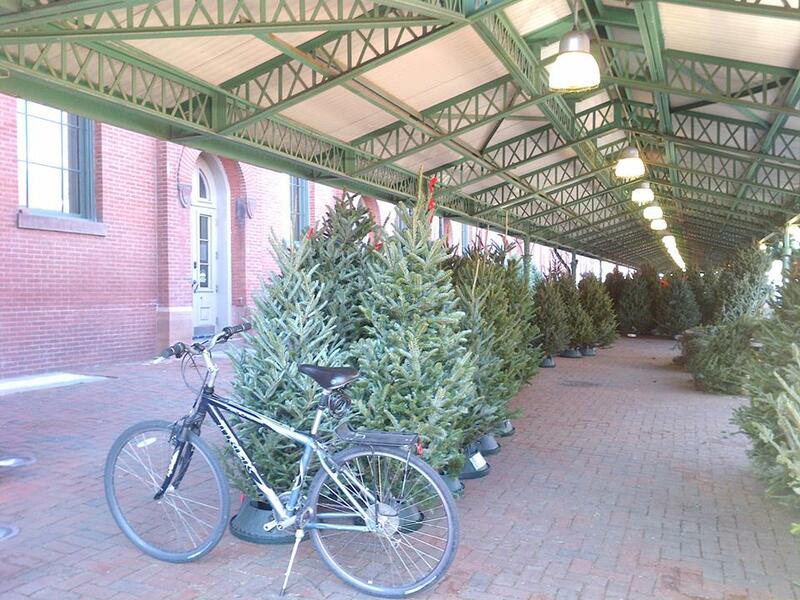 (15) A Christmas tree stand at Eastern Market selling fresh-cut Christmas trees. 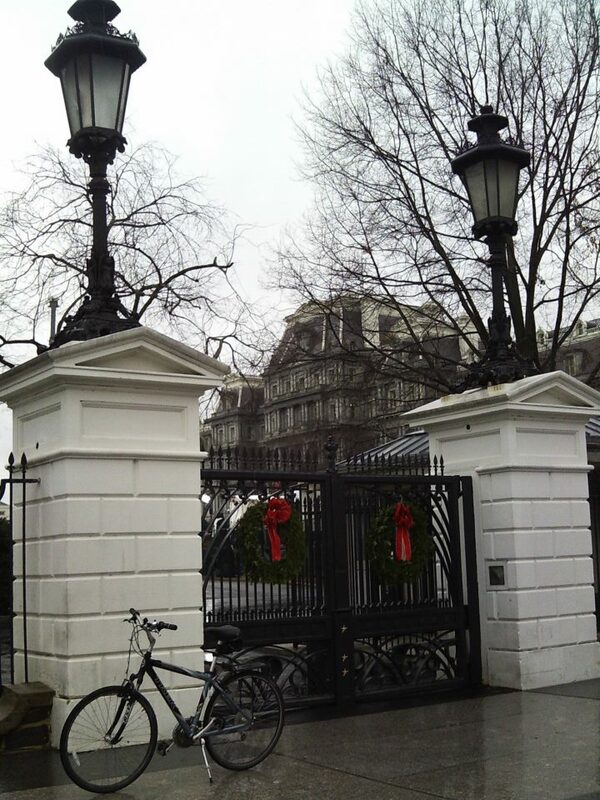 (16) The White House gates included decorative bows for the holidays. 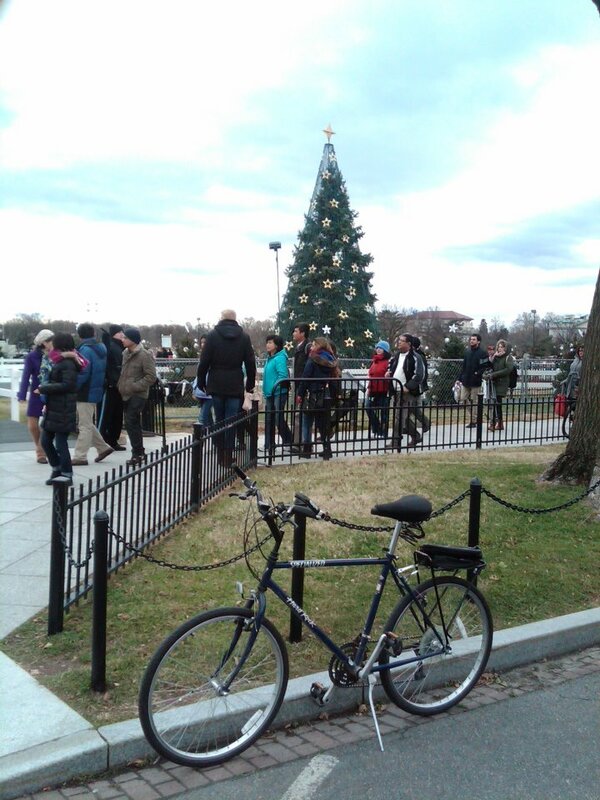 (17) The National Christmas Tree on the Ellipse at President’s Park just south of the White House. 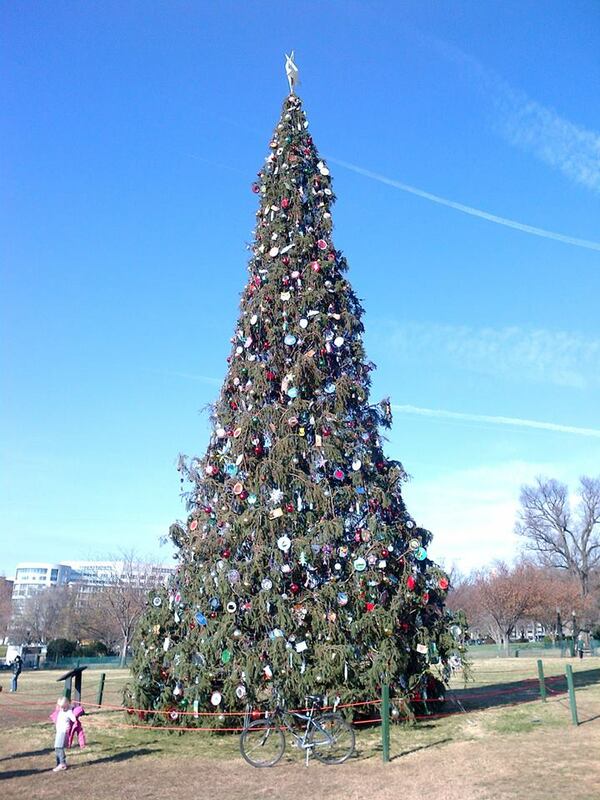 (18) The Capitol Christmas Tree on the West Lawn of the U.S. Capitol Building grounds. (19) Festively decorated Christmas trees, like this one, could be seen in the windows of stores and office buildings on almost every block. 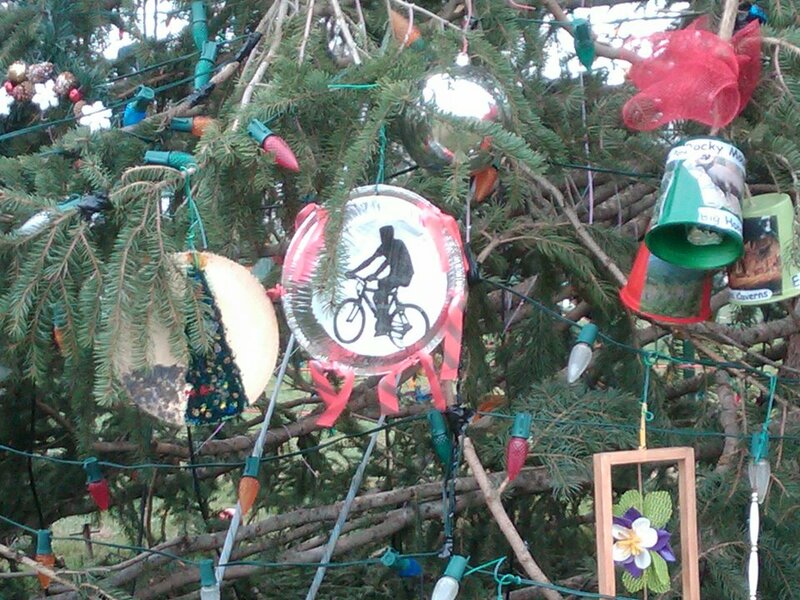 (20) And the final photo is of a bike-themed ornament that I saw on the Capitol Christmas Tree, which seemed too relevant to not be included in this blog post. I’d like to take this opportunity to wish all of you reading this, whether you are here in D.C. and anywhere else around the world, a very Merry Christmas and a happy and healthy New Year. On this day in 1957, U.S. military personnel suffered their first casualties of the Vietnam War when 13 Americans were wounded in three terrorist bombings of Military Assistance Advisory Group and U.S. Information Service installations in Saigon. The rising tide of guerrilla activity in South Vietnam reached an estimated 30 terrorist incidents by the end of the year and at least 75 local officials were assassinated or kidnapped in the last quarter of 1957. Unfortunately, this was just the beginning for the U.S. By the end of the war in 1975, estimates for the total U.S. casualties during the Vietnam War are 58,286 killed in action or non-combat deaths (including the missing and deaths in captivity), 153,303 wounded in action, and 1,645 missing in action. In addition to U.S. casualties, estimates place the number of deaths for the Democratic Republic of Vietnam and the Viet Cong at 1.1 million, while 220,357 were killed in action from the Republic of Vietnam. It is also estimated that 4,407 from the Republic of Korea, 487 from Australia. 351 from Thailand, 37 New Zealanders, and 30,000 Laotian Meo/Hmong were killed. Additionally, estimates place the number of civilian deaths between 195,000-430,000 in South Vietnam, and 50,000-65,000 in North Vietnam. 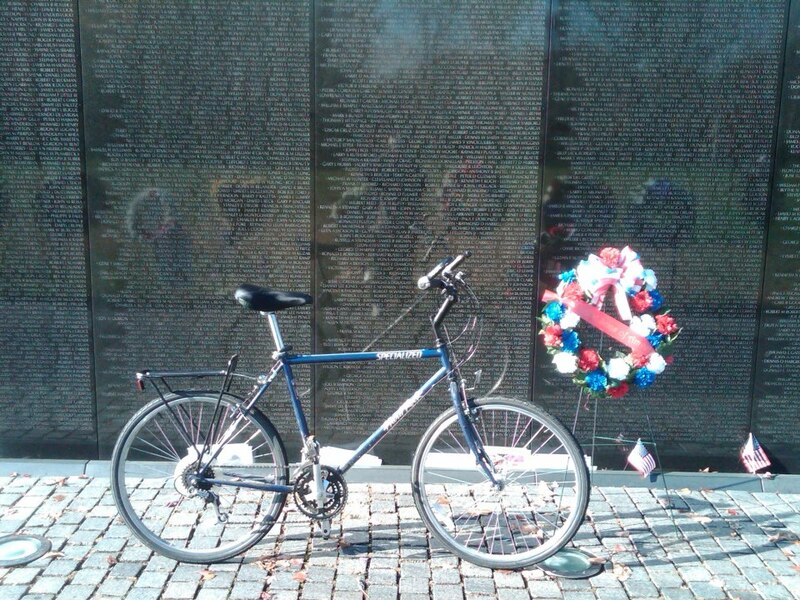 In remembrance of the events of this day and in honor of those who served and sacrificed, on this lunchtime bike ride I rode to the Vietnam Veterans Memorial Wall. 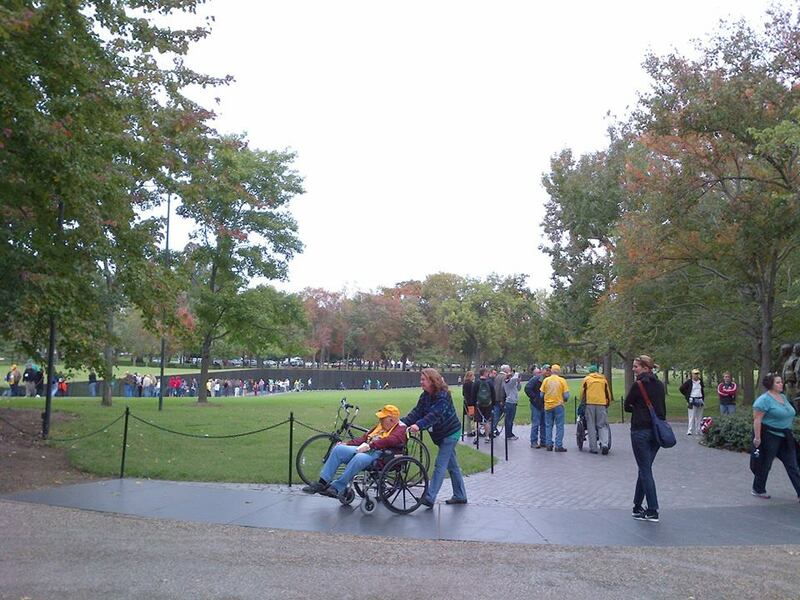 Located in Constitution Gardens adjacent to the National Mall, just northeast of the Lincoln Memorial (MAP), the Memorial Wall is the best-known part of the Vietnam Veterans Memorial complex, which also includes The Three Soldiers Statue and The Vietnam Women’s Memorial. The Memorial Wall is comprised of two gabbro walls which total 246 feet 9 inches in length. The walls are sunk into the ground, with the earth behind them. At the apex where they meet which is the highest point, they are 10.1 feet high. They taper to a height of only 8 inches at either end. One wall points toward The Washington Monument, the other in the direction of the Lincoln Memorial, and they meet in the middle. 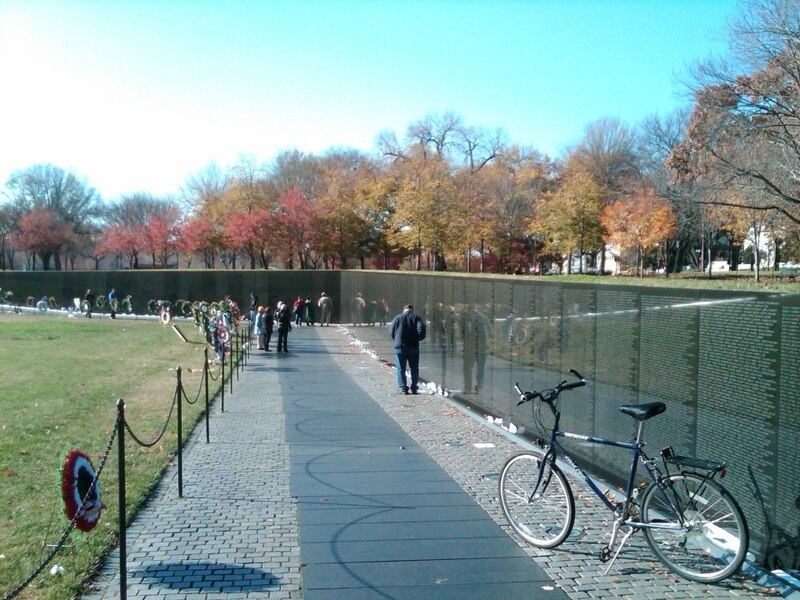 Each wall has 72 inscribed panels, with the two very small blank panels at the extremities remaining blank. Inscribed on the panels are the names of servicemen who were either confirmed to be killed in action or remained classified as missing in action when the walls were constructed. The 58,272 names, which includes 8 women, are listed in chronological order. The names include approximately 1,200 who are listed as missing. The names of the missing are denoted with a cross. If they return alive, although this has thus far never occurred, the cross would be circumscribed by a circle. If their death is confirmed, a diamond will be superimposed over the cross. 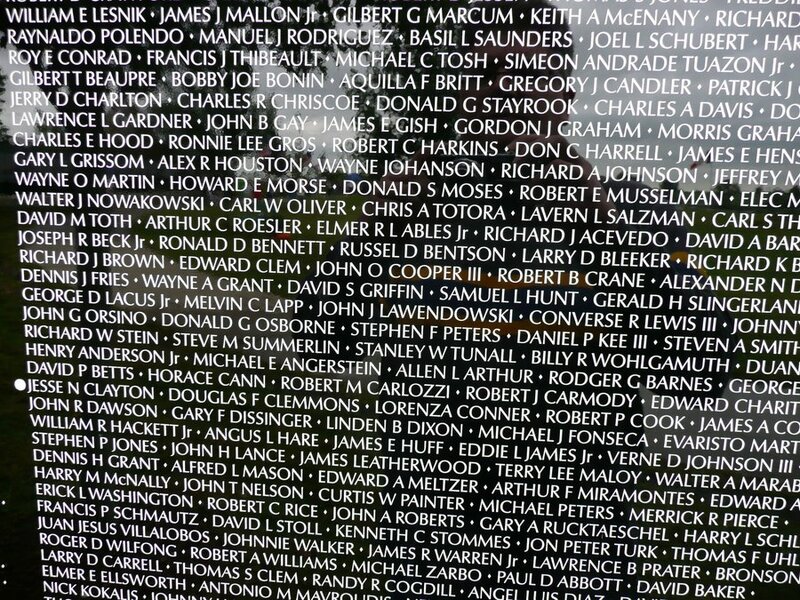 The wall is made from highly reflective stone so that when a visitor looks upon it, his or her reflection can be seen simultaneously with the engraved names. This is meant to symbolically bring the past and present together. However, if you are unable to experience and see the Wall in person, there is a half size replica called The Moving Wall, which periodically visit hundreds of small towns and cities throughout the country from April through November, spending five or six days at each site. Veterans groups have subsequently created additional traveling replicas, which include The Traveling Wall created by the American Veterans Traveling Tribute, The Vietnam Traveling Memorial Wall by Vietnam and All Veterans of Brevard, Inc, and The Dignity Memorial Vietnam Wall by Dignity Memorial. Fixed replicas have also been built in Wildwood, New Jersey and Winfield, Kansas. 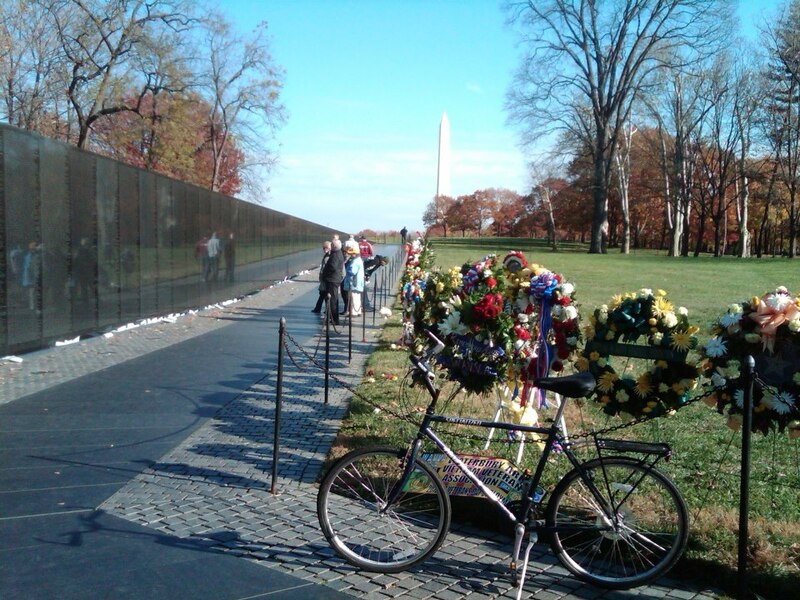 So take a few minutes to visit D.C.’s Vietnam Veterans Memorial Wall, or one of the travelling or virtual walls, and remember the 58,272 individuals who are honored, including the ten different people on the wall who were killed on this day during the war. They are John Dominick Arquillo (age 21), William Olen Austin (19), John Thomas Baker (20), Alexander Beard (28), John David Belles (20), Guy Lester Bellew (35), Gary Lee Binder (20), Murray Lyman Borden (25), Robert White Boyd (23), and John Wesley Brooks (19). 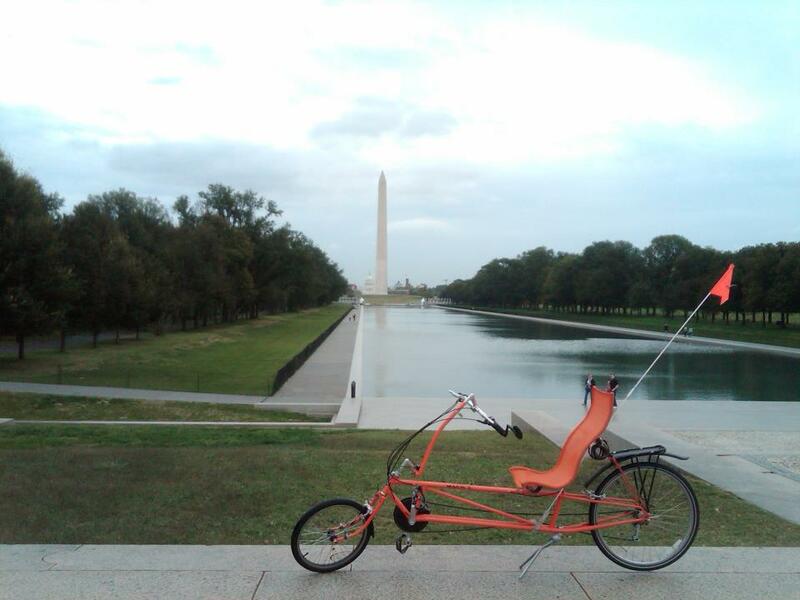 On this ride I went by the Lincoln Memorial Reflecting Pool, located on the National Mall directly east of the Lincoln Memorial (MAP), with The Washington Monument to the east of the reflecting pool. It is lined by walking paths and shade trees on both sides. Depending on the viewer’s vantage point, it dramatically reflects the Lincoln Memorial, as well as the Washington Monument, the Mall’s trees, and the expansive sky above D.C. The Reflecting Pool was designed by American architect Henry Bacon, who also designed The Lincoln Memorial. It was constructed beginning in 1922, following the dedication of the President Lincoln’s Memorial, and completed the following year. At over a third of a mile long and 167 feet wide, with a a depth of approximately 18 inches on the sides and 30 inches in the center, the Lincoln Memorial Reflecting Pool is the largest of the many reflecting pools in D.C.
A few years ago the National Park Service determined that the Reflecting Pool’s massive weight had begun to cause it to leak and sink, while the approximately 6,750,000 gallons of water in it had become stagnant. As a result, it underwent an extensive rennovation. The massive project , which was part of President Barack Obama’s economic stimulus package called the American Recovery and Reinvestment Act of 2009, shut down a large swath of the National Mall for almost two years as the old pool was removed and the new one constructed. The Reflecting Pool reopened just before Labor Day in 2012. The newly renovated landmark remains the largest in D.C., but is shallower than the original, measuring less than three feet at its deepest point. This not only makes it lighter but saves water as well. Its bottom is tinted gray to make the water darker and more reflective. And the new pool has been reengineered with a circulation and filtration system. So instead of continuing to use city water, it draws river water from the nearby Tidal Basin, conserving approximately 20 million gallons of drinking water each year. As a result of the renovation project, the grounds also include new security features to prevent a vehicle from reaching the Lincoln Memorial for a potential terrorist attack, like the one which occurred in 2003 when an angry tobacco farmer from North Carolina named Dwight Ware Watson brought much of the nation’s capitol to a standstill for two days when he drove a tractor into the pond in the nearby Constitution Gardens area of the National Mall and claimed to have explosives. When visiting the Reflecting Pool, one cannot help but reflect on the rich history of events that have taken place there. Included in the long list of events are when singer Marian Anderson sang at an open air concert on Easter Sunday in 1939, because she had been denied permission to perform at D.C.’s Constitution Hall because she was African American. On August 28, 1963, the Reflecting Pool was also the site of Martin Luther King Jr.’s “I Have a Dream” speech, delivered from the steps of the memorial to a crowd of 250,000 people during the Civil Rights Movement’s March on Washington for Jobs and Freedom. And several protests against the Vietnam War took place in the late 1960’s and early 1970’s around the Reflection Pool, attracting hundreds of thousands of protestors. These and many other events make the Lincoln Memorial Reflecting Pool a site for reflection in more ways than one.